I realized how quickly this week flew by when I looked down at my calendar and noticed it's the end of February. How did two months of 2016 already fly by? I don't know about you... but I am in shock! We are already 1/6th of the way through the year. Unbelievable! I've had a few goals over the past years that I've never made it around to finishing... practicing yoga, meditating daily, more DIY projects (and posting about them)... How did two months this year go by and I've barely started? Well, I realized that the reason I haven't mastered these things is because I've been busy. So, I decided it's time to just make the time. I downloaded the Headspace App two weeks ago and am 20 days in to meditating once a day for just 10 minutes. Last Sunday I began yoga. It's been years since I practiced and I just did it. The thing is, we make excuses for the reasons we haven't made the time. The truth is, if you aren't getting to something... you have to start somewhere. This year the biggest thing in my life is to get my priorities in order and align priorities with values. I value good health - therefore I now eat vegan and get exercise. I value a calm spirit - so I journal, meditate and take time to really reflect. I value knowledge - so I read relentlessly. I value leadership - so I spend time with those who are capable of mentor-ship and I changed my job to lead others. None of this happened overnight, but every minute we choose more and more of who we are. 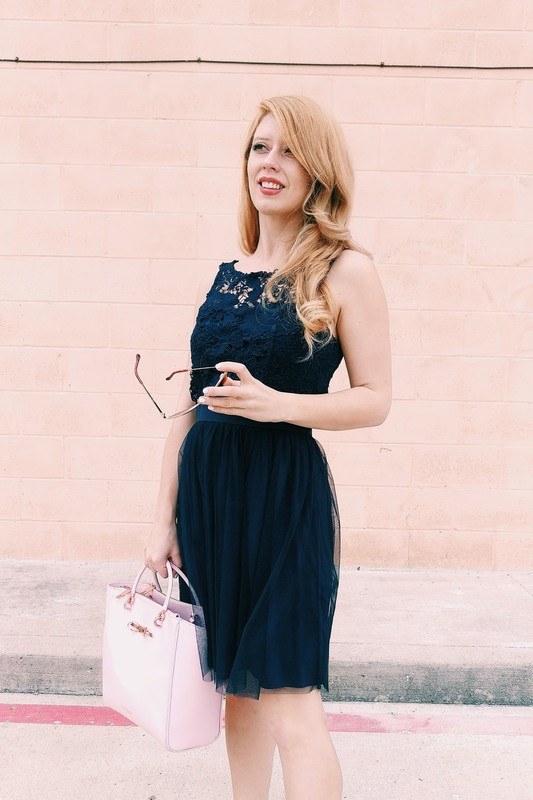 Whether I am running around town, headed to the office or just grabbing coffee - I chose what I want to look like. I wear the things I love to wear whether or not I am overdressed or if they are in style. I listen to the music I want to listen to whether or not it plays on the radio. I spend time the way I want to because it ultimately defines my life. Today's look was a good example of my favorite type of outfits - feminine, slightly dressy and simple. 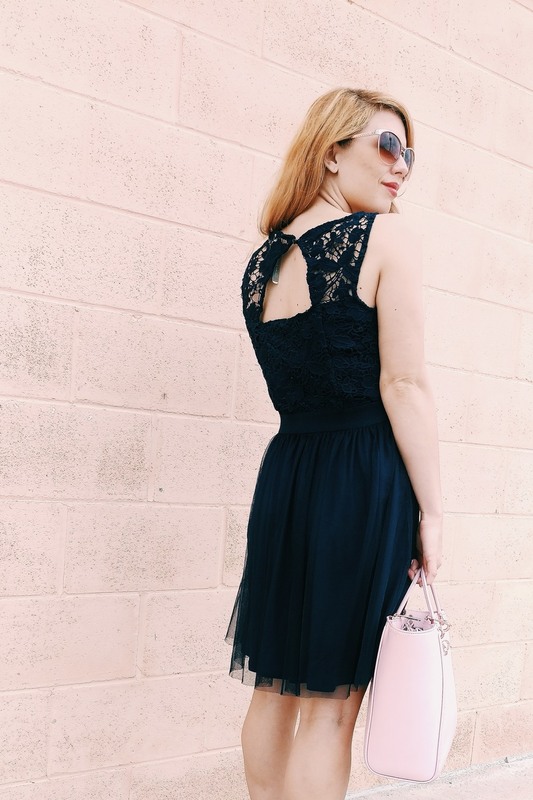 A navy lace and tulle dress paired with simple white pumps and a pastel handbag was the perfect look for a Sunday morning at church. Sometimes it's nice to just throw on a dress instead of worrying about matching pants to a top. What are some of your favorite looks to throw together?